When I started the first ever parkrun back in 2004 I had no idea that we would become such a large and vibrant family. Over the years, you have been determined to make the parkrun event ubiquitous, making loads of requests for us to facilitate the start of another event where you live. Wherever possible we have and continue to fulfil these requests. So much so that we are now over 300 events across eight countries in the world. One of the best things about parkrun is the fact that each of our events is a "REAL" community. These are real people getting together at least once a week for a real run and some real friendships. The community spirit extends to those other parkrunners you happen to meet, see out for a run or when they visit your event too. We welcome them in as if they are family. And so each local community grows in number and strength week after week. Once a year we have the opportunity to unite as a global community. 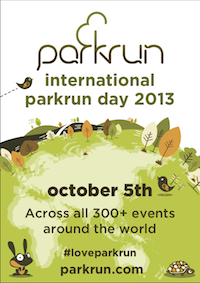 On the anniversary of the first ever parkrun, the first Saturday of October, we celebrate "international parkrun day". It’s our ninth anniversary this year and we are hoping that everyone will join us to celebrate. We want as many of you as possible to make short 30 second video clips of special moments at your parkrun on the 5th October then to share it with us and the world via social media using the hashtag #loveparkrun. This will enable us to collate all of your messages from Facebook, Twitter, Instagram etc and use them to show the rest of the world just how great parkrun really is. The favourite video clips will be used to make the first global parkrun promotional film, so if you’re a budding Spielberg or Tarantino now is your chance to take centre stage!